The central processing unit (CPU) of a computer is what manipulates data by performing computations. In practice, almost all computers use a storage hierarchy,:468–473 which puts fast but expensive and small storage options close to the CPU and slower but larger and cheaper options farther away. Generally the fast volatile technologies (which lose data when off power) are referred to as "memory", while slower persistent technologies are referred to as "storage". In the Von Neumann architecture, the CPU consists of two main parts: The control unit and the arithmetic logic unit (ALU). The former controls the flow of data between the CPU and memory, while the latter performs arithmetic and logical operations on data. Without a significant amount of memory, a computer would merely be able to perform fixed operations and immediately output the result. It would have to be reconfigured to change its behavior. This is acceptable for devices such as desk calculators, digital signal processors, and other specialized devices. Von Neumann machines differ in having a memory in which they store their operating instructions and data. :20 Such computers are more versatile in that they do not need to have their hardware reconfigured for each new program, but can simply be reprogrammed with new in-memory instructions; they also tend to be simpler to design, in that a relatively simple processor may keep state between successive computations to build up complex procedural results. Most modern computers are von Neumann machines. Data are encoded by assigning a bit pattern to each character, digit, or multimedia object. Many standards exist for encoding (e.g., character encodings like ASCII, image encodings like JPEG, video encodings like MPEG-4). By adding bits to each encoded unit, redundancy allows the computer to both detect errors in coded data and correct them based on mathematical algorithms. Errors generally occur in low probabilities due to random bit value flipping, or "physical bit fatigue", loss of the physical bit in storage of its ability to maintain a distinguishable value (0 or 1), or due to errors in inter or intra-computer communication. A random bit flip (e.g., due to random radiation) is typically corrected upon detection. A bit, or a group of malfunctioning physical bits (not always the specific defective bit is known; group definition depends on specific storage device) is typically automatically fenced-out, taken out of use by the device, and replaced with another functioning equivalent group in the device, where the corrected bit values are restored (if possible). The cyclic redundancy check (CRC) method is typically used in communications and storage for error detection. A detected error is then retried. Primary storage (also known as main memory, internal memory or prime memory), often referred to simply as memory, is the only one directly accessible to the CPU. The CPU continuously reads instructions stored there and executes them as required. Any data actively operated on is also stored there in uniform manner. Secondary storage (also known as external memory or auxiliary storage), differs from primary storage in that it is not directly accessible by the CPU. The computer usually uses its input/output channels to access secondary storage and transfer the desired data to primary storage. Secondary storage is non-volatile (retaining data when power is shut off). Modern computer systems typically have two orders of magnitude more secondary storage than primary storage because secondary storage is less expensive. 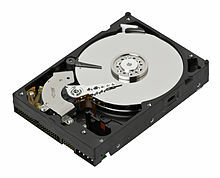 In modern computers, hard disk drives (HDDs) or solid-state drives (SSDs) are usually used as secondary storage. The access time per byte for HDDs or SSDs is typically measured in milliseconds (one thousandth seconds), while the access time per byte for primary storage is measured in nanoseconds (one billionth seconds). Thus, secondary storage is significantly slower than primary storage. 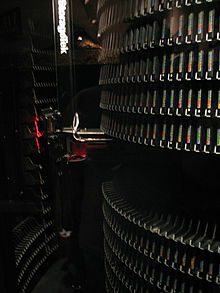 Rotating optical storage devices, such as CD and DVD drives, have even longer access times. Other examples of secondary storage technologies includeUSB flash drives floppy disks, magnetic tape, paper tape, punched cards, and RAM disks. Once the disk read/write head on HDDs reaches the proper placement and the data, subsequent data on the track are very fast to access. To reduce the seek time and rotational latency, data are transferred to and from disks in large contiguous blocks. Sequential or block access on disks is orders of magnitude faster than random access, and many sophisticated paradigms have been developed to design efficient algorithms based upon sequential and block access. Another way to reduce the I/O bottleneck is to use multiple disks in parallel in order to increase the bandwidth between primary and secondary memory. Secondary storage is often formatted according to a file system format, which provides the abstraction necessary to organize data into files and directories, while also providing metadata describing the owner of a certain file, the access time, the access permissions, and other information. Most computer operating systems use the concept of virtual memory, allowing utilization of more primary storage capacity than is physically available in the system. As the primary memory fills up, the system moves the least-used chunks (pages) to a swap file or page file on secondary storage, retrieving them later when needed. If a lot of pages are moved to slower secondary storage, the system performance is degraded. Tertiary storage or tertiary memory is a level below secondary storage. Typically, it involves a robotic mechanism which will mount (insert) and dismount removable mass storage media into a storage device according to the system's demands; such data are often copied to secondary storage before use. It is primarily used for archiving rarely accessed information since it is much slower than secondary storage (e.g. 5–60 seconds vs. 1–10 milliseconds). This is primarily useful for extraordinarily large data stores, accessed without human operators. Typical examples include tape libraries and optical jukeboxes. 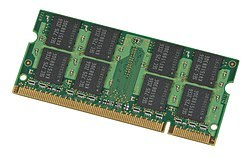 A 1 GB module of laptop DDR2 RAM. Utilities such as hdparm and sar can be used to measure IO performance in Linux. 2.5-inch hard disk drives often consume less power than larger ones. Low capacity solid-state drives have no moving parts and consume less power than hard disks. Also, memory may use more power than hard disks. Large caches, which are used to avoid hitting the memory wall, may also consume a large amount of power. Full disk encryption, volume and virtual disk encryption, andor file/folder encryption is readily available for most storage devices. Hardware memory encryption is available in Intel Architecture, supporting Total Memory Encryption (TME) and page granular memory encryption with multiple keys (MKTME). and in SPARC M7 generation since October 2015..
As of 2011[update], the most commonly used data storage media are semiconductor, magnetic, and optical, while paper still sees some limited usage. Some other fundamental storage technologies, such as all-flash arrays (AFAs) are proposed for development. A Williams tube used a cathode ray tube, and a Selectron tube used a large vacuum tube to store information. These primary storage devices were short-lived in the market, since the Williams tube was unreliable and the Selectron tube was expensive. uses different mechanical phases of phase-change material to store information in an X-Y addressable matrix, and reads the information by observing the varying electrical resistance of the material. Phase-change memory would be non-volatile, random-access read/write storage, and might be used for primary, secondary and off-line storage. Most rewritable and many write once optical disks already use phase change material to store information. stores information in DNA nucleotides. It was first done in 2012 when researchers achieved a rate of 1.28 petabytes per gram of DNA. In March 2017 scientists reported that a new algorithm called a DNA fountain achieved 85% of the theoretical limit, at 215 petabytes per gram of DNA. Storage area network (SAN) is a specialized network, that provides other computers with storage capacity. The crucial difference between NAS and SAN, is that NAS presents and manages file systems to client computers, while SAN provides access at block-addressing (raw) level, leaving it to attaching systems to manage data or file systems within the provided capacity. SAN is commonly associated with Fibre Channel networks. ^ a b c Patterson, David A.; Hennessy, John L. (2005). Computer Organization and Design: The Hardware/Software Interface (3rd ed.). Amsterdam: Morgan Kaufmann Publishers. ISBN 1-55860-604-1. OCLC 56213091. ^ Storage as defined in Microsoft Computing Dictionary, 4th Ed. (c)1999 or in The Authoritative Dictionary of IEEE Standard Terms, 7th Ed., (c) 2000. ^ "Primary Storage or Storage Hardware" (shows usage of term "primary storage" meaning "hard disk storage") Archived 10 September 2008 at the Wayback Machine. Searchstorage.techtarget.com (2011-06-13). Retrieved on 2011-06-18. ^ J. S. Vitter, Algorithms and Data Structures for External Memory Archived 4 January 2011 at the Wayback Machine, Series on Foundations and Trends in Theoretical Computer Science, now Publishers, Hanover, MA, 2008, ISBN 978-1-60198-106-6. ^ A thesis on Tertiary storage Archived 27 September 2007 at the Wayback Machine. (PDF) . Retrieved on 2011-06-18. ^ Pearson, Tony (2010). "Correct use of the term Nearline". IBM Developerworks, Inside System Storage. Retrieved 16 August 2015. ^ National Communications System (1996). "Federal Standard 1037C – Telecommunications: Glossary of Telecommunication Terms". General Services Administration. FS-1037C. Archived from the original on 24 October 2011. Retrieved 8 October 2007. See also article Federal Standard 1037C. ^ Mike Chin (8 March 2004). "IS the Silent PC Future 2.5-inches wide?". Archived from the original on 20 July 2008. Retrieved 2 August 2008. ^ Mike Chin (18 September 2002). "Recommended Hard Drives". Archived from the original on 5 September 2008. Retrieved 2 August 2008. 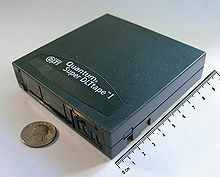 ^ Super Talent's 2.5" IDE Flash hard drive – The Tech Report – Page 13 Archived 26 January 2012 at the Wayback Machine. The Tech Report. Retrieved on 2011-06-18. ^ Power Consumption – Tom's Hardware : Conventional Hard Drive Obsoletism? Samsung's 32 GB Flash Drive Previewed. Tomshardware.com (2006-09-20). Retrieved on 2011-06-18. ^ a b Aleksey Meyev (23 April 2008). "SSD, i-RAM and Traditional Hard Disk Drives". X-bit labs. Archived from the original on 18 December 2008. ^ New Samsung Notebook Replaces Hard Drive With Flash Archived 30 December 2010 at the Wayback Machine. ExtremeTech (2006-05-23). Retrieved on 2011-06-18. ^ Welcome to TechNewsWorld Archived 18 March 2012 at the Wayback Machine. Technewsworld.com. Retrieved on 2011-06-18. ^ Mac Pro – Storage and RAID options for your Mac Pro Archived 6 June 2013 at the Wayback Machine. Apple (2006-07-27). Retrieved on 2011-06-18. ^ MacBook Air – The best of iPad meets the best of Mac Archived 27 May 2013 at the Wayback Machine. Apple. Retrieved on 2011-06-18. ^ MacBook Air Replaces the Standard Notebook Hard Disk for Solid State Flash Storage Archived 23 August 2011 at the Wayback Machine. News.inventhelp.com (2010-11-15). Retrieved on 2011-06-18. ^ The DVD FAQ Archived 22 August 2009 at the Wayback Machine is a comprehensive reference of DVD technologies. ^ a b Náfrádi, Bálint (24 November 2016). "Optically switched magnetism in photovoltaic perovskite CH3NH3(Mn:Pb)I3". Nature Communications. 7: 13406. doi:10.1038/ncomms13406. PMC 5123013. PMID 27882917. Archived from the original on 28 November 2016. ^ New Method Of Self-assembling Nanoscale Elements Could Transform Data Storage Industry Archived 1 March 2009 at the Wayback Machine. Sciencedaily.com (2009-03-01). Retrieved on 2011-06-18. ^ Yong, Ed. "This Speck of DNA Contains a Movie, a Computer Virus, and an Amazon Gift Card". The Atlantic. Archived from the original on 3 March 2017. Retrieved 3 March 2017. ^ "Researchers store computer operating system and short movie on DNA". Phys.org. Archived from the original on 2 March 2017. Retrieved 3 March 2017. ^ "DNA could store all of the world's data in one room". Science Magazine. 2 March 2017. Archived from the original on 2 March 2017. Retrieved 3 March 2017. ^ Erlich, Yaniv; Zielinski, Dina (2 March 2017). "DNA Fountain enables a robust and efficient storage architecture". Science. 355 (6328): 950–954. doi:10.1126/science.aaj2038. Archived from the original on 2 March 2017. Retrieved 3 March 2017.